Nana Fanny's site uses only one cookie. It is a session cookie, which is deleted at the end of your browser session. It holds no personally identifiable data relating to our site visitors, other than the broad geographical location. This serves to ensure the site delivers the correct information in terms of local contacts, currency and taxes. Nana Fanny's produces amazing Salt Beef from a 1944 recipe which is arguably London's best, alongside amazing vegetarian falafels as featured in London's evening Standard and Time Out. 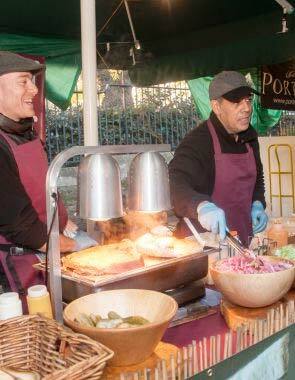 We have operated out of premier London markets including Borough, Camden Lock West Yard, Broadway and Old Spitalfields and we are currently recruiting for Borough market as well as new locations expectantly opening. We pay £8 to £10.20 per hour for customer servers, and for managers up to £30,000 pa plus bonuses, or more for a star!! Full training will be given for what will be a fast paced street food job including setting up from 8.30am (subject to location), preparing our Salt Beef , creating amazing Salt Beef sandwiches and various filled Bagels, cooking, preparing and serving our award winning falafels, customer service etc. You MUST speak fluent English with perfect understanding, be reliable, good under pressure, enjoy public interaction , have a great appearance as you will be representing our brand, the ability to be on your feet all day, great communication skills and enjoy working outside. You must also be able to carry out heavy lifting as the stalls quite often need to be erected and dismantled at the beginning and end of each day. This is essential. We pay £8 to £10.20 per hour for customer servers, and for managers up to £30,000 pa plus ote bonuses or more for a star!! The stalls operate up to 7 days per week so we will have plenty of hours on offer. Our concept is set to role out into several other locations requiring more staff and managers so what starts as a job today, could end up as a career tomorrow. All training will be carried out either on site, or at our Borough Market location which is at London Bridge station. You will need to be able to get there. If you meet the criteria above, and are up for the challenge, then email us by clicking the logo at the top of the page. We are excited about further expansion, new opportunities and about the future for Nana Fanny's street food inc Salt Beef & falafels........ are you? What have you got to lose? Apply now!